Usually traditional video surveillance cameras have embedded flaws such as blind spots. Fixed cameras usually narrow on an exact area in a room. If your camera is pointed to the left and the incident occurs on the right, your camera can be useless. Yes, you can redund cameras to capture every room corner. However, in that case you will be forced to carry extra installation costs, hardware and licensing costs. What should we do, when our budgets decrease and clients want a practical solution? The answer is a fisheye effect camera! Fisheye or as they are also called panoramic cameras offer you much wider field of view than fixed cameras, usually up to 360 degrees. Panoramic camera is designed to capture a full circle. Usually they are installed on the ceiling looking straight down so it can capture, record and reproduce full perspective. Nevertheless, using a pure fisheye camera image might be very uncomfortable. 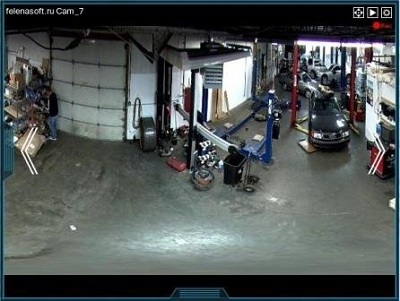 When it comes to professional video surveillance, such image needs to be decoded. This process is called dewarping. It allows the curved fisheye effect to become corrected so it looks like normal camera’s image. 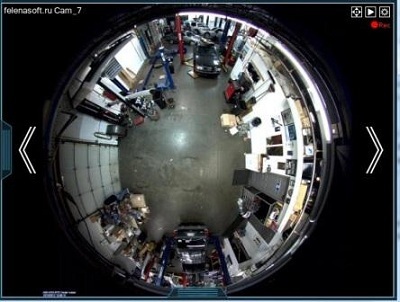 Video surveillance program Xeoma gives you the ability to first dewarp the image and then perform full PTZ in live and recorded fisheye effect images. 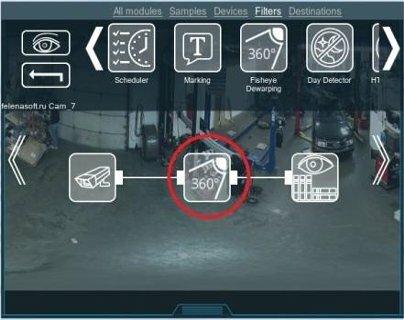 Fisheye Dewarping module helps you reach the most common goal: to capture the largest amount of information with the least amount of cameras from a single advantageous position. When you connect your panoramic camera to Xeoma for the first time, you will get this type of picture, usually the form of a peephole. Just like a door peephole, this camera type allows you to capture more vertical or horizontal area in your picture without moving the camera. To get the corrected picture, please add the Fisheye Dewarping module to the chain. This module will help you to dewarp image from fisheye effect cameras and get it in the regular format. Here’s where the magic begins: you get the full normal camera view with the PTZ option. This module produces an image that is more similar to a panoramic photo. In dewarped image, you can concentrate on details that are important to the situation, while also having the option of looking at the whole picture. Depending on your security needs, a panoramic camera may be what you’re looking for, because it provides surveillance for broad areas and with the help of Xeoma you can easily convert it to a more comfortable view.